Well... I am officially a Law Student. Today was day one of Orientation and overall, it went pretty great. 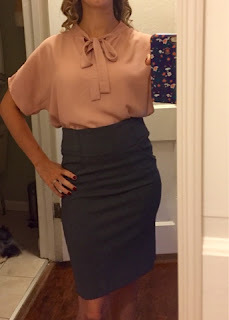 I agonized over what to wear; the guidelines simply said "business casual". That is SO ambiguous! After a few texting sessions with one of my best friends, we settled on a pencil skirt and a silk bow neck blouse with small heels and minimal jewelry. Turns out, I was appropriately dressed if not slightly overdressed; I saw people in jeans and flip flops! I arrived 20 minutes early as per my usual habit. I spent a solid 2 minutes in my car giving myself a pep talk and then I strutted in the doors of my institution for the next 3 years. Thankfully I entered the correct doors and the admissions crew was there to greet us and give us our packets. The head of admissions remembered me and asked me all about my summer and my wedding; it was reassuring knowing that at least someone knew me and I knew someone... even if she works for the university. Next up was the alumni table where they gave us a free leather portfolio donated by an alumnus of the college of law. We were given the person's information in order to send along a thank you note or email. I think it is really awesome how involved the alumni are in the school and the current students and it was a lovely gift. The next table was Student Bar Association and they were wanting to collect dues.... of course I forgot my checkbook at home on the table. After this they sent us into the auditorium to await the Dean's welcome. 20 minutes later, his speech finally began. In those 20 minutes, I watched the promotional video playing in the background at least 3 times straight, watched a ton of people enter the room and grew more and more nervous. Finally, the Dean walked on stage and it went better from there out. His speech was nice and energizing; the main points were work hard and don't be a jerk. Solid advice if you ask me. Next was two alumni speakers; the first barely spoke English and the second had us rolling on the floor laughing. He first made us all stand-up and recite "May it Please the Court" a few times just to get us practiced for the rest of our careers. He also talked about what the college of law meant to him and how important these three years are. Lastly, he told all of us to call him and he would take us out to lunch at any time throughout our law school career. Pretty cool guy. When this concluded, they gave us instructions to pick up a piece of paper in the back, write our names and two questions on it and then enter the forum area and await instructions. The girl down the aisle from me came closer and we both looked at each other at the same time and asked if the other understood why we were doing this. We laughed and proceeded to complete the instructions while getting to know each other. Fitting that this was a social mixer as I thankfully made my first law school friend. I found out she is a Gryffindor; we were instant companions. Turns out, the papers we filled out were to be folded into paper airplanes and we launched them from the second-floor balcony. Mine was awful; apparently, the episode of The Office with the paper airplane contest did not teach me anything. We then proceeded to pick up a random plane and find the person it belonged to. I met two other guys in my class this way. 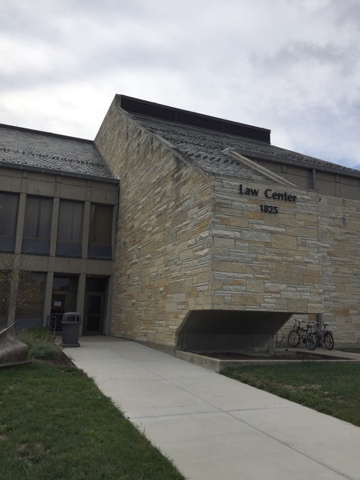 Up next was Westlaw and LexisNexis training sessions. The Westlaw guy made us close our eyes and visualize and his suit was made of an unknown fabric- we are betting on stretchy lycra through. Plus side, free highlighter and donuts. 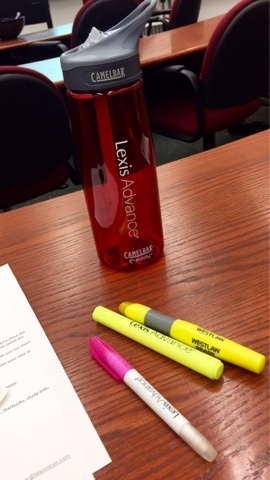 Next was LexisNexis- free Camelbak water bottle, two highlighters and cookies. So far, Lexis is winning based on free swag. I have been waiting for a red Lexis Camelbak since my first visit to a Law School.... all real law students have one! The next event was a reception to mingle with staff and students. My new friend and I entered, grabbed some cheese and crackers and found an empty table. It threw me off that there was alcohol offered at the reception; my undergraduate university was a completely dry campus so this was different to say the least. Soon some other people approached our table and we all began talking. Turns out there is two other girls engaged so I am not the only old (almost) married lady! Also, more Harry Potter fans so that was a plus. We all talked for a long while and were soon invited to the bar mixer just down the street. As much as we all wanted to go to bed, we decided to head out to the bar for a quick drink. Once at the bar, I learned more about my new companions and liked them more and more. A ton of the 2L's and 3L's came by and introduced themselves, gave insight on law school and professors and got to know us. 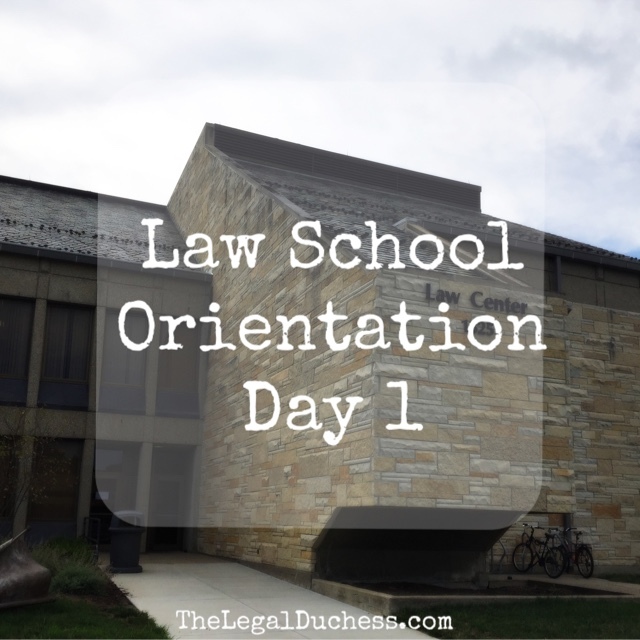 It was really cool to meet so many upperclassmen and get some great insight into my law school. One of them I was pretty sure was a long lost cousin of Barney Stimpson from How I Met Your Mother so that was pretty entertaining. Overall, I am glad I went to the bar even though I only drank water. It was a fun night. Now I am back home, laying out my clothes for tomorrow and ready to take on another day of orientation. Thus far I am super pleased with my law school choice and it is good thus far. Check back tomorrow for the day 2 recap. I am literally holding back nervous-tears as I read about your first day! I am encountering my first day in roughly 19 days. I am as nervous as can be! I have worked so hard to be at this point and I am getting goosebumps just writing about it! How silly it is to be so emotional! Thank you for writing about your experience. Hopefully I can continue to learn some things from you! You can email me at kdvandonge@gmail.com if you have any life-changing advice! God Bless!